Last episode we discussed the German submarine actions of 1916 and some of the technological changes that occurred during the war as it related to the U-Boats and the British attempts to get them under control. This week we are solely focused on perhaps the most important event of the entire war at sea, and certainly the most important event related to the U-Boats, and that is the decision made by Germany to begin an unrestricted submarine campaign in 1917. This campaign would see the Germans throw all of their available U-Boats at the British and neutral shipping to try and take the British out of the war, and it would be the prototype for what would happen on a much lengthier scale during the Second World War. We will start off with a lengthy discussion of all of the discussions, meetings, and disagreements with the German government on the subject that led up to the declaration of the campaign in early 1917. We will spend the last bit of this episode discussing what happened when the campaign began and some of its early consequences. Decisions like the one that the Germans made in early 1917 to begin an unrestricted submarine campaign that could have negative consequences for their war effort were not made in a vacuum, there were civilian and military reasons behind their choices. As the war continued into its third year the effects of German public opinion were one of those reasons. Around the country German citizens were already on near starvation rations due to the blockade and there was no longer any belief that the United States would use its power to do anything about it. The daily caloric intake for Germans was far below the amount required to maintain health and civilian mortality was already a third higher than before the war. The elderly and small children felt the effects of this hardship the worst, and tuberculosis cases almost doubled. People all over Germany began to demand action, and the only kind of action that the German military could provide was unrestricted U-Boat operations. Around Germany the U-Boats would become a symbol of revenge, victory, and a way to end the war and the suffering it had caused. All of these factors caused an immense amount of pressure for the civilian government. That civilian government had long believed that it might be necessary to find a way, economically, to push Britain out of the war, or at least to greatly impede their war effort. To this end the Admiralty had created Department B-1 which had been staffed with some of the leaders of the German economy. Financial, industrial, commercial, and agrarian experts were all brought onto the team and they began to collect and analyze data on the British economy and trade. They were searching for vulnerabilities and trying to determine just how vulnerable they were, an early target for this research was the British wheat supply, which was almost entirely import based. Inside the German civilian government the resistance to a new unrestricted campaign was led by Chancellor Bethmann-Hollweg. This opposition was not driven by any humanitarian concerns but more practical issues that Bethmann-Hollweg believed might be the result of such a campaign. To put it simply he did not believe that the U-Boats would defeat the British, he did not believe that they could sink as much as they claimed, and even if they could it would not have the results that the navy liked to talk about. He also greatly feared the possibility of the United States officially entering the war, a fear that was waning in the minds of other German leaders since they believed that it was inevitable regardless of what actions the German navy took. Throughout 1916 Bethmann-Hollweg's opposition, joined by other members of the government like Foreign Minister Jagow and Ambassador von Bernstorff in Washington was enough to keep the navy at bay. He believed that the possibility of launching the campaign was a strictly political decision and that the military should have play a role in that decision saying that the decision “directly affects our relations with neutral states and thus represents an act of foreign policy . . . for which I have sole and untransferable responsibility.” Most importantly in all of this, Bethmann-Hollweg, at least for most of 1916 could count on the full support of the Kaiser, who had the ability to end any debate on the subject. Seeing into the future and what might happen the Chancellor decided to circulate a peace note near the end of 1916. We have bumped up against this note in our story a few different times. This was the one that Bethmann-Hollweg sent out on December 12th in which he asked all the country to comes together to begin negotiations for peace. The Entente, of course, rejected it. Later President Wilson sent out a note to all parties, asking them to reveal their war aims so that hopefully the continent could move towards peace. Bethmann-Hollweg and the others within the German government had been hoping for the United States to take a leading role in peace discussions. As it was the Entente would never agree to reveal their war aims because that would involve revealing the promises they had made to the countries that they had brought into the war like Italy, Romania, and Japan, all of them promised large territorial acquisitions which would require the destruction of the Austro-Hungarian and Ottoman empires. Therefore they just ignored Wilson's request. The Germans would then also ignore the request since the military leadership and civilian leadership could not agree on what they would respond with. Overall Bethmann-Hollweg and the rest of the German civilian government were disappointed once again by the United States they had hoped that Wilson and the Americans would use their power to be more forceful in their pursuit of peace. It might have been a false hope to begin with, with Wilson favoring the Entente so frequently in the first two years of the war, but they were still hoping. I have went into these two efforts, the German and then the American calls for peace discussions because they actually played a role in the declaration of unrestricted submarine warfare. The Entente had rejected an offer to negotiate outright, without even attempting to move forward, and it was apparent that the United States could no longer be counted on to play a role in the peace. This meant that there was now only one option, the war must be fought to its conclusion, and the Germans must win, the survival of the national depended on it. There was no longer any concept of going too far. While the political leadership of Germany was against the unrestricted campaign the Army also, at least for the moment, shared their opinion albeit for different reasons. Ludendorff was concerned about the Navy's proposals because he feared that if too many neutral ships were sunk, especially those from Holland and Denmark, they might enter the war. Their armies were not necessarily the most impressive in Europe, but just the sheer mileage of front that would have to be occupied would put a strain on a German army which was by the end of 1916 at a breaking point. A timeline note here, these conversations were happening right around the time that Romania entered the war, meaning that Hindenburg and Ludendorff, who had just assumed overall command, were trying to scrape together enough troops to launch an attack against Romania. Other than maybe the last few months of 1918 this as quite possibly the worst moment in the entire war to have other European countries join into the war against Germany, they just did not have any more men to go around. This mindset would begin to change by the end of the year though. During those last 4 months of 1916 the situation in the West and East stabilized, the battle of the Somme and Verdun came to an end and Romania had its face kicked in by the Germans and Austrians. Because of these successes the support for unrestricted submarine warfare began to rise in the German Army High Command. While the situation was in some ways far better in the short term Ludendorff was also swayed to the side of the Navy by an appreciation for how bad the long term prospects looked for Germany. After surveying the situation in the West Ludendorff believed that the German army simply could not handle more attrition battles like those of 1916. The German Army did not have the ability to endure and endless series of sieges in the West, they were just too costly, so they had to find a way to alter the balance of the situation and the U-Boats seemed like the only way. With the army leadership now on side, all that remained was for the Navy to lay out its case to the civilian government and then convince the Kaiser to support them. The biggest proponent of the campaign was the Chief of the German Naval Staff Admiral Henning von Holtzendorff. He would lay out his reasonings, his assumptions, and his goals in a memorandum that he published on December 22, 1916 which would drive many of the discussions of the following month that would lead up to the Germans starting their campaign. In this memo, which weighed in at something like 200 pages, he laid out a lengthy series of figures and charts detailing the situation in Britain and what the Germans needed to do to greatly effect it. The detail was impressive, the calculations included easy items like how much grain the British needed but also other factors like prices, cargo space, freight rates, shipping insurance rats, and the amount of all the various goods that the British had on hand. All of these were used to calculate how badly an unrestricted campaign would hurt them. The key commodity was always wheat, which the Germans estimated the British could not overcome a shortage of. Holtzendorff estimated that the British had access to about 10.75 million tons of cargo space. Much of this cargo space was from neutral countries, about 3 million tons worth, and he believed that the unrestricted campaign would scare at least half of this neutral shipping off of the seas, since they would not be able to afford the loss rates and insurance rates that would go along with them. Because of this Holtzendorff claimed that all Germany needed to do was sink 600,000 tons of shipping a month for 5 months and at that point the British would be forced to sue for peace. This was a much higher amount than the Germans were sinking under the more restrictive rules of engagement in use at the time and the only hope of reaching 600,000 tons was a move to an unrestricted campaign. There were many bad assumptions made in the memo, although most of them would only become apparent later. For example, while it was possible for the Germans to roughly hit the 600,000 tons per month goal it would not be enough to force the British out of the war. The memo also completely disregarded any reaction from the British. The Germans clearly did not believe that the British would find an effective counter to the U-Boats and they also believed that the counter that would eventually be arrived at by the British, the convoying of ships together, would actually be better for the U-Boats. In fairness to the Germany Navy the British Navy also believed that convoying ships together would make the U-Boat problem worse, a mindset that we will dive into next episode. For now though Holtzendorff's plan seemed impressive and Hindenburg and Ludendorff fully supported it by the end of the year. Holtzendorff would also put a date on his proposal writing that "I have come to the conclusion that we must have recourse to unrestricted U-boat warfare, even at the risk of war with America, so long as the U-boat campaign is begun early enough to ensure peace before the next harvest, that is, before 1 August." This memorandum would be a key document when the Germans leaders would meet at the beginning of 1917 to discuss the reopening of their unrestricted campaign. A key part of all of these discussions was America, what America would do, would she enter the war, would she stay out? The British blockade had certainly already infringed on neutral rights so that would not necessarily be the determining factor, but the blockade was not killing any Americans. The blockade also was not having much of an effect on the American economy, with the country raking in massive economic profits from the war, even without the ability to trade with Germany. The net gain in trade during the first three years of the war was almost 5 billion dollars. On the flipside of this the unrestricted campaign, by its very nature, would be more threatening to American citizens and business interests. Ships would be sunk that were owned and operated by American businesses, American sailors would be killed or injured. This would then put the United States in an impossible situation and would probably lead to war. Many of the German leaders did not consider this a reason not to do campaign though. This was driven by the belief that the United States was going to enter the war anyway and the general misconception that America would not be that problematic in the war anyway. The Germans were in an impossible situation, there was no good answer. There were two important meetings around the renewal of the U-Boat campaign. The first was at Pless on August 30th, which is where Holtzendorff began pushing for the campaign once again. Th is would then lead to all of the discussions and memos that we have already covered. The second, and more important, was the meeting that took place on January 8, 1917. At this meeting Holtzendorff could count on the support of Ludendorff and Hindenburg. 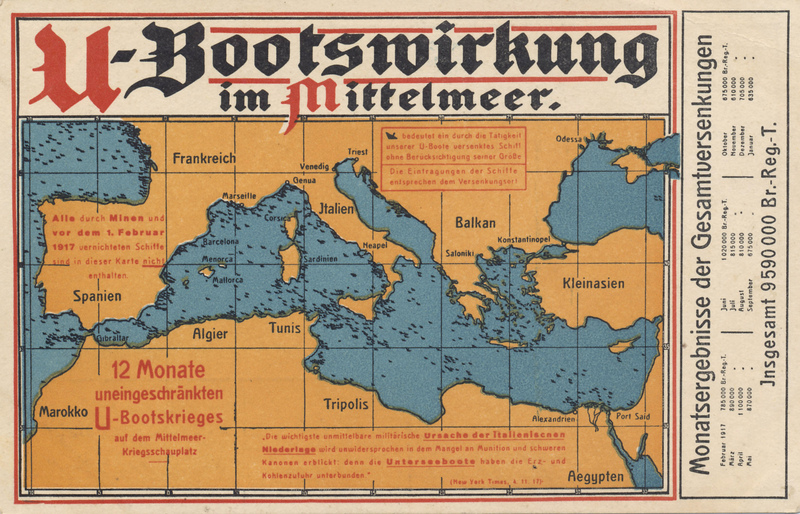 Ludendorff made his intentions clear when, before the meeting even took place, he sent a message to Bethmann-Hollweg saying that the new U-Boat campaign was "the only means of carrying the war to a rapid conclusion, the military position does not allow us to postpone." When the meeting started Bethmann-Hollweg found out quite quickly that he did not have the support to get the Kaiser to say no to the plan. The military leaders had been putting pressure on the Kaiser and Bethmann-Hollweg knew that if he forced the Kaiser to choose between himself and the military he would lose. Therefore Bethmann-Hollweg gave in saying “If the military authorities consider the U-boat war necessary, I am not in position to oppose them.” Once the civilian opposition was out of the way the process was quick and the order would go out from the Kaiser immediately "I order the unrestricted submarine campaign to begin on 1 February with the utmost energy." This would end up being a catastrophically bad move for the Germans, but mainly for reasons they could not have known about. At this point in January 1917 they did not know that in just two months the Russian government would fall and by the end of the year the country would be effectively out of the war. They also could not know that the French army was close to collapse and the Neville offensive in the spring would almost break them. Finally they could not know that in early 1917 the British, who had been basically funding the entire Entente war effort were running out of cash. They had spent a lot of money in America since the war started and in just a few months they probably would have been unable to continue purchasing at the rate that they were when 1917 started which would have severely crippled not just their war effort but also that of their allies. This is a topic we will take a much deeper dive into during later episodes. The plan was for the U-Boats to immediately begin engaging any ship that was obviously armed. The big change would not start until February 1, at which point any ship, even those that were not armed, even those of neutral nations, would be attacked without warning. The only exception would be obvious hospital ships, but even these humanitarian ships would not be totally exempt with those in the English Channel being a target due to the belief that they were being used to ferry troops to the continent. Even obvious passenger liners and ships of the Belgian Relief effort were only given a single week to reach port before they would be attacked. The campaign would not be officially announced until the evening of January 31 just a day before it began. At ten minutes after 4 on the afternoon of January 31 German Ambassador Bernstorff arrived at the office of the United States Secretary of Stage Lansing. He informed Lansing that unrestricted submarine warfare would begin at midnight. For the previous 2 weeks Bernstorff had known that this was coming and he had tried everything in his power to change it. On January 16 he had written to Lansing, who then forwarded the message to the President, that "We have modified submarine war, waged in retaliation against illegal English starvation policy, to meet American wishes. In return we expected the U.S. government would contend with us for freedom of seas and obtain from England reestablishment of legitimate neutral trade with Germany….England has conceded nothing but instead boasts of more and more success in strangling Germany. We therefore may expect and should be grateful if America at last takes energetic steps to establish real freedom of sea." When this message went unanswered there was simply nothing that the Ambassador could do. After reading the official note to Lansing Bernstorff would say "I know it is very serious, very, and I deeply regret that it is necessary." to which Lansing replied "I believe you do regret it, for you know what the result will be. But I am not blaming you personally." For all of the nations in the war, when they learned of the German declaration they believed that it was a certainty that the United States would enter the war. In Germany the population was filled with hope that this move by their government even if news of the new campaign was followed quickly by news that the United States had broken all diplomatic ties. They believed that this would ring a quick end to the war, which was the best possible outcome. In America President Woodrow Wilson still hoped that the United States could stay out of the war. It had only been a few weeks since Wilson had given his famous Peace Without Victory speech where he hoped that all of the belligerent countries could come together to form a lasting peace. 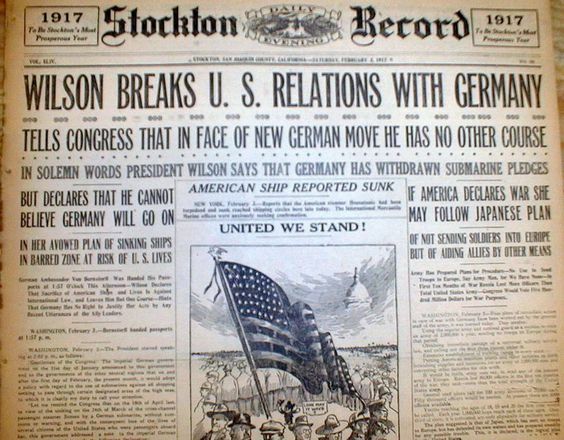 Even after the announcement of the U-Boat campaign Wilson would continue his push to keep the United States neutral and in position to be a peace maker. However, this view was not shared by the other members of his government and their push for war became too strong. On February 3 he ordered that the German Ambassador be given his passports and be sent back to Germany and he recalled the American ambassador in Berlin. This severed all diplomatic ties with Germany, and the only remaining step was to declare war, but this step was not taken immediately. For the next month the situation remained mostly static. There seemed to be a possibility that the German campaign would not drive the United States into the war, and in fact American public opinion was mixed on the topic. Wilson seemed to be waiting for the public to make up its mind, and in the east there was a lot of support for the war while in the other regions of the country opinion was mixed. The momentum of the war was just unavoidable though and on April 6th the country would be at war. Yes, I skipped a ton of information between February 3 and April 6, but don't worry, in just a few weeks we will take the time to tell the full story of how and why America entered the war. Before we get to that story, we need to get back to the topic of these episodes. The Germans had declared unrestricted submarine warfare and unleashed their fearsome fleet of U-Boats, we what happened next? Well at first the results were slow in coming. It took time to get the U-Boats to sea and for their captains and crews to get adjusted to the new rules of engagement. There was also a change in how the U-Boats were positioned in the seas. The longest U-Boat missions were around 4 to 6 weeks, during that time the goal of every U-Boat was to find enough ships to use all of their torpedoes. 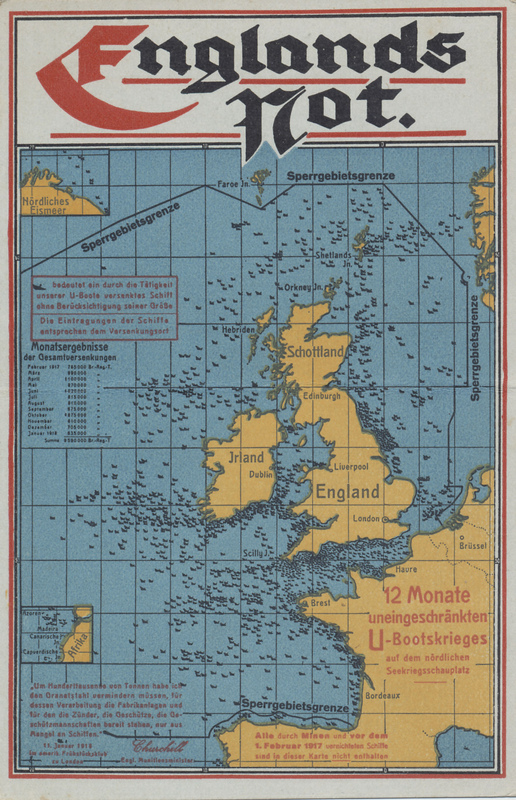 To try and maximize the amount of time that the U-Boats were in the best hunting grounds of the Atlantic the Germans changed their travel routes so that instead of going around Scotland the U-boats took a more direct, but more dangerous, route through the English channel. This cut 6 days worth of travel time off each U-Boat sortie, a pretty hefty percentage of the time they were at sea, and the British defenses in the channel proved to be far easier to bypass than expected. When this was combined with an absolute minimum amount of time spent in port, with maintenance and crew leave reduced as much as possible, it allowed the Germans to have far more subs on patrol at a given time than at any previous point in the war. By having so many U-Boats in the proper hunting grounds the tonnage sent to the bottom of the ocean rose in February to 500,000 tons, about 50 percent more than the month before. In March this number rose to 565,000 tons, and in April it would reach the staggering sum of 860,000 tons. This month, April 1917 would be the greatest month for the U-Boats ever, in either war, with the second largest month, November of 1942, coming in a distance second of 730,000 tons. This came at a cost though, and in May the number dipped all the way back down to 600,000 tons. This is because the Germans simply ran out of steam. The effort in April had only been possible by pushing the men and their machines to their absolute limit. In May some of the subs had to be laid up for repairs, some of their crews had to be rested. I'm not saying that to in anyway reduce or minimize their accomplishments in April though. The 860,000 tons were far above even the most optimistic German estimates, and far above what was thought necessary for the campaign to be a success, it would unfortunately for the U-Boats be all downhill from there. Of course it was not the numbers that actually mattered, what mattered was the effect that those numbers had on the British. The first mistake by the British was the belief that their defenses against moving U-Boats through the channel was impenetrable, this defense was called the Dover Barrage. In fact, the U-Boats felt little threat from these defenses and while they had to stay submerged during their journey through the channel they were rarely in danger. The greatest danger for the British lay in the Western Approaches, which was the area between Land's End, the Irish Coast, and the Bay of Biscay. Churchill would call this area a "veritable cemetery of British shipping." After the start of the campaign Sir Joseph Maclay, the Controller of Shipping would say that "Statistics prove that what are called areas of concentration (ie the convergence of trade routes) as now managed, have become veritable death traps for our Mercantile Marine and our men are realizing this." The first months of the unrestricted campaign would cost the British 1.9 million tons of shipping, and while this would make things difficult in Britain for awhile, they would not be in serious danger of being forced from the war, at least in the short term. After those first three months the British would also begin to respond, which is where we will take up our story next episode as the unrestricted campaign comes to a climax as the American enter the war, the British first refuse but then embrace the convoy system, and the Germans learn that they simply do not have enough U-Boats.